What’s that you say? Your poor turntable didn’t take enough punishment this year from all those disgustingly heavy releases that 2014 treated you to? Well, Black Bow Records are here to crack that bullwhip against the arse of your record player once again with a 7″ vinyl-only-go-home-you-CD-sissies split courtesy of Belfast pioneers of the Pummel, Slomatics, alongside Miami-based aggression mob Holly Hunt. Slomatics landed one of the albums of the year back in February 2014 with the scintillating ‘Estron’, which cut away from their traditional knuckle-dragging ‎heaviosity in favour of a groove-ride through the outer cosmos astride their dynamic, sludgy spaceship. Their lone track on this release entitled Ulysses, My Father is a slight return to their more direct, pulverising approach to songcraft; lumbering basslines and riffs which bury through your cranium and into your very (in)sanity, all topped off with Marty Harvey ‘s high-end wails and coma-inducing cymbal smashes from behind the kit. It’s not to say that their contribution here isn’t groovy and progressive at all, but it’s definitely a re-departure from their Estron approach to planet-slaying, slightly more atmospheric doom, by simply getting back to their riff-lead basics with several hundred giant bangs. What would happen if everyone in Meshuggah apart from Mårten Hagström and Tomas Haake got struck down with the winter flu and said remaining duo decided to write a doom song instead of polymathomorphic extreme metal? It’s most likely that something like Holly Hunt would happen. The affectionately-named Bill Ward is an instrumental-only, angular cut of dynamic sludge rock that doffs its cap as much to Black Cobra as much as it does to Black Sabbath. Drummer Beatriz Monteavaro‘s (ex-Floor/Cavity) cut-n-blow-dry fills sit sweetly underneath guitarist Gavin Perry‘s juddering, fragmented, yet groovy-as-Goliath riffage as the duo toss time signatures across the bar at each other before blending them back up again into a cocktail that combines the muscular physique of djent with the ethos of doom and the attitude of raw sludgy sewerage. I’m not sure about the bandname here myself, but I definitely like what I’m hearing out of the speakers from these dudes. Short ‘n sweet as 7-inches always are, this bulldozer‎ ultimately splutters out of gas far too soon for both bands on the release, which is still well worth hunting down with your best Black Bow and arrow. And with 2015 just around the corner, I for one am looking forward to whatever both Slomatics and Holly Hunt conjure up for us next. 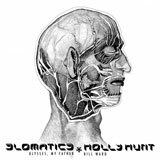 2014, Black Bow Records, Digital, Doom, Heavy, Holly Hunt, Pete Green, Review, Slomatics, Sludge, Split 7"